Dealers job may seem to be a very glamorous but it is in fact a very demanding job. A dealer will have to work for long hours, will need to stand or sit for hours in a row and will often have to deal with very difficult players at their tables. For a dealer, a typical schedule would be one hour of dealing at the table after which there will be a twenty minute break. This could also be 40 minutes on the table and then followed by a twenty minute break. The cycle will continue till the end of the shift. In smaller casinos, dealers are allowed to leave the table for longer times if there is not too much rush. However, in larger casinos there are more regular schedules. The full time dealers have an eight hour shift and have a fairly regular schedule at work. In bigger casinos the players will also get plenty of other benefits like health insurance. The second hand smoking effects permanently affect dealer`s health. 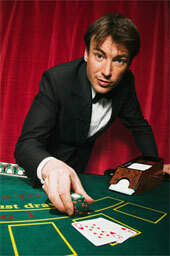 For dealers it is very necessary to always get to the casino a few minutes early to work each day. Before the shift begins the dealers are required to be at the casino at least ten minutes in advance. This will give them a chance to get hold of any new information and also for checking the tokes. Casinos have a road map to follow which is made before the start of the shift. Usually, four dealers are assigned three tables since one dealer would always be on a break at any given time. A dealer has to check the road map before beginning the day. The dealers will have to often handle a table which has not been opened yet. The chips have to be placed under the table and have to be counted by the dealer in order to verify it against the closing amount. There will be a slip which will have to be signed by the dealer. Also, the floor manager will open new decks of the cards and hand it over to the dealer in order to check if the cards are all there. The jokers have to be removed and the cards have to be checked properly to see if they have not been tampered with in any way. The cards also have to be shuffled by the dealers according to the policy of the casino. Even during the game the cards have to be shuffled several times during the day. All this actions are necessary for further hand shuffle. Dealers are also responsible to deal out the cards and handle the process accurately as per the procedures set up by the casino. Security is always very important and the dealers have to ensure that they maintain it. The dealer has to be aware of the bets on the table all the time and is required to never take their eyes off the table. The floor manager will always be watching the dealer and so it is important to properly handle the cards, chips and cash on the table.